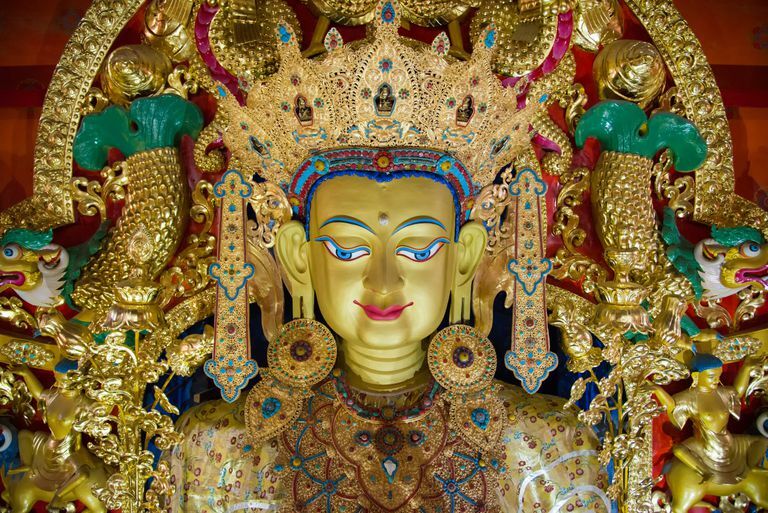 The Jataka Tales are stories of the Buddha's previous lives when he was called a Bodhisattva. This story, sometimes called The Golden Dear or the Ruru Deer, appears in the Pali Canon (as the Ruru Jataka, or Jataka 482) and in the Jatakamala of Arya Sura. Once the Bodhisattva was born as a deer, and he made his home deep in a lush forest. He was a particularly beautiful deer, with golden fur that sparkled like many-colored gems. His eyes were as blue as sapphires, and even his horns and hooves shone with the luster of precious stone. The Bodhisattva realized his dazzling appearance would make him desirable to men, who would capture and kill him and hang his beautiful hide on a wall. So he remained in the thickest parts of the forest where humans rarely ventured. Because of his wisdom, he gained the respect of other forest creatures. He guided the other animals as their king, and he taught them how to avoid the snares and traps of hunters. One day the golden dear heard the cries of a man being carried away in the strong rapids of a rain-swollen river. The Bodhisattva responded, and he cried out in a human voice, "Do not fear!" As he approached the river it seemed the man was a precious gift being brought to him by the water. The Bodhisattva entered the treacherous current, and bracing himself, he allowed the exhausted man to climb on his back. He carried the man to the safety of the bank and warmed him with his fur. The man was beside himself with gratitude and wonder at the marvelous deer. "No one has ever done anything for me such as you have done today," he said. "My life is yours. What can I do to repay you?" To this, the Bodhisattva said, "All I ask is that you do not tell other humans about me. If men knew of my existence, they would come to hunt me." So the man promised to keep the deer a secret. Then he bowed and began the journey back to his home. At that time, in that country, there was a Queen who saw extraordinary things in her dreams that eventually became real. One night she dreamed of a brilliant golden deer that sparkled like jewels. The deer stood on a throne, surrounded by the royal family, and preached the dharma in a human voice. The Queen awoke and went to her husband, the King, to tell him of this astonishing dream, and she asked him to go and find the deer and bring it to the court. The King trusted his wife's visions and agreed to find the deer. He issued a proclamation to all of the hunters of his land to look for the shining, golden deer spotted with many colors. Whoever could bring the deer to the king would receive a rich village and ten beautiful wives in payment. The man who had been rescued heard that proclamation, and he was greatly conflicted. He was still grateful to the deer, but he was also very poor, and he imagined himself struggling with poverty for the rest of his life. Now a life of plenty was in his grasp! All he had to do was break his promise to the deer. So, as he continued his journey, he was pushed and pulled by gratitude and desire. Eventually, he told himself that as a wealthy man he could do the world a lot of good to make up for breaking his promise. Resolved, he went to the King and offered to take him to the deer. The King was delighted, and he gathered a large body of soldiers and set out to find the deer. The rescued man guided the entourage over rivers and through forests, and they eventually came to where the unsuspecting deer was grazing. "Here he is, your Majesty," the man said. But when he raised his arm to point, his hand fell from his arm as if it had been cut by a sword. But the King had seen the deer, which sparkled in the sun like a treasury of jewels. And the King was overcome with a desire to obtain this beautiful creature, and he fitted an arrow to his bow. "Stop, mighty prince! And please explain how you found me here? The King, astonished, put down his bow and pointed to the rescued man with his arrow. And the deer said, harshly, "Truly, it is better to take a log out of a flood than to save an ungrateful person from it." "You speak words of blame," the King said. "What do you mean?" "I do not speak with the desire to blame, Your Majesty," the deer said. "I spoke sharply to a wrong-doer to prevent him from doing wrong again, just as a physician might apply a harsh remedy to cure his own son. I speak harshly because I rescued this man from danger, and now he brings danger to me." The King turned to the rescued man. "Is this true?" he asked. And the man, now filled with remorse, looked down at the ground and whispered, "yes." Now the King grew angry, and once again he fitted the arrow to his bow. "Why should this lowest of men live any longer?" he roared. But the Bodhisattva placed himself between the King and the rescued man. "Stop, Your Majesty," he said. "Do not strike one who is already stricken." The deer's compassion moved and humbled the King. "Well said, holy being. If you forgive him, so will I." And the King promised to give the man the rich reward he had been promised. Then the golden deer was brought to the capital. The King invited the deer to stand on the throne and preach the dharma, just as the Queen had seen in her dream. "I believe all the moral laws can be summed this way: Compassion to all creatures," the deer said. "The practice of compassion to all creatures should cause humans to regard all creatures as their own families. If a person regards all creatures as his own family, how can he even think of harming them? "For this reason, the sages know that the whole of righteousness is contained in compassion. Great king, keep this in mind and practice compassion to your people as if they were your sons and daughters, and your reign will be glorified." Then the king praised the words of the golden deer, and he and his people took up the practice of compassion to all creatures with their whole hearts. The golden deer disappeared back into the forest, but birds and animals enjoy safety and peace in that kingdom to this day.